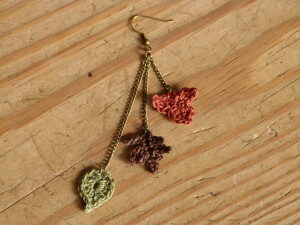 If you’ve paid any attention to the earrings I have designed so far on Crochet Spot, such as my Spring Flower Earrings and Giselle Earrings, you will notice that I am a big fan of the long, dangle-y type. One reason is because I wear my hair down most of the time and they are the only ones that show. So I am adding to my “collection” a set of fall earrings. These earrings are loose and breezy, perfect for the season. Choose any colors you please and have fun! 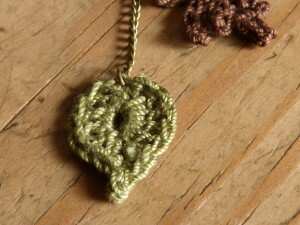 Gauge Swatch: 1’’w x 1’’h ( 2.5 cm x 2.5 cm) ch 9. Attach one jump ring to the top of each leaf. Measure 2 1/4” of chain and attach to Leaf #1. Measure 1 3/8” of chain and attach to Leaf #2. 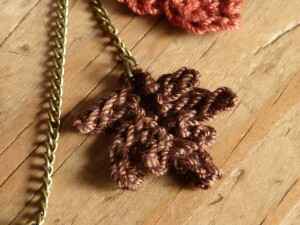 Measure 3/4” of chain and attach to Leaf #3. Join the top of each chain with one jump ring and attach jump ring to earring loop. If you run into any problems just leave me a comment below and I’ll get back with you as soon as possible! 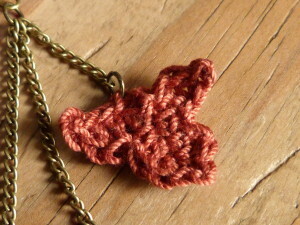 This entry was posted on Wednesday, October 23rd, 2013 at 12:00 AM by Amy	and is filed under Free Crochet Patterns. You can follow any responses to this entry through the RSS 2.0 feed. You can skip to the end and leave a response. Pinging is currently not allowed. i love these,i was wondering if i could sell them? I love these! Going to make me a pair. I also love leafs. Thank you for sharing. absolutly beautiful ! Love the colors and creativity of them ! Simply wonderful ! Absolutely Adorable I love them thank you so much for sharing such a fun and great pattern, I live on disability and can’t afford patters but I still love to be able to crochet every chance I can. hugs and stay blessed! i LOVE these…. however, i am unsure about the rows 1 &2-8 in the first step…… i am not getting three chains for the leafs… thanks! Which leaf in particular are you having trouble with?